The ToxiRAE Pro LEL monitor is designed to detect and accurately measure explosive and combustible gases and vapours in concentrations from 0 to 100% of the lower explosive limit (LEL) with a resolution of 1% LEL. With an onboard library of 34 correction factors, the ToxiRAE Pro LEL can be programmed to automatically read in % LEL of the specified compound. 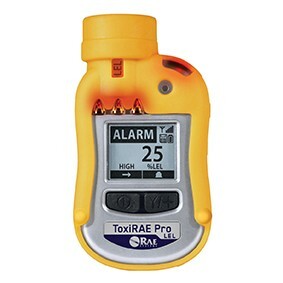 The ToxiRAE Pro LEL takes worker protection to the next level by providing safety professionals wireless access to real-time instrument readings and alarm status from any location for better visibility and faster response.